That entertaining spinner of yarns about medicine’s unsolved mysteries, Oliver Sacks, wrote a study of a Micronesian island where a community shared total colorblindness from birth. His account’s provocative title, The Island of the Colorblind, might also serve as a title for a critical essay about apparent colorblindness among giants of modern architecture who have so effectively bypassed, marginalized, or mutely domesticated the most vividly imaginative uses of color. Think of how Frank Lloyd Wright’s more audacious coloristic forays in architecture – gardens and stained glass notwithstanding – were window frames accented in “Cherokee Red.” And there’s Mies’s coppery façade to the Seagram building. And coming into our time, Gehry’s fondness for a high-sheen, metallic palette, the blinding titanium shimmer of the Guggenheim Bilbao’s façade. Consider how various shades of white façades – now moving toward degrees of translucence or transparency – rule among architectural titans, with the ghosts of Gaudì and the great Mexican color-master Luis Barragán hiding in the shadows as lonely, color-besotted innovators. 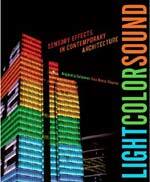 So there’s something bracing in flipping through the pages of Light Color Sound: Sensory Effects in Contemporary Architecture by Alejandro Bahamón and Ana Maria Álvarez (W.W. Norton, $75). Their interest in color is intimately connected with how high-tech advances have made possible not just more daring kinetic color designs in architecture, but also sensory interaction with artificial sound experiences. As Álvarez notes in her workmanlike introduction, this multi-sensory involvement in architecture is hardly a 21st century invention. Le Corbusier’s Phillip’s Pavilion design for the 1958 Universal Expo in Brussels was a dazzling interactive design where Corbu’s architecture was dynamically interacting with electronic music by composer Edgar Varèse and architect-composer Iannis Xenakis. But what’s unique now are computer-controlled building façades punctuated with LED lights that have become a commonplace presence in our cityscapes. One key example, well photographed and annotated here, is the New 42nd Street Studios by Platt Byard Dovell White Architects. During the day, the building’s façade is a handsome collage of metal and glass that doesn’t call undue attention to itself. But computers activate a remarkably tasteful light show from dusk until 2:00 AM. In contrast to the neon anarchy of blazing flickering colors at Times Square, here is a façade as artfully realized as Piet Mondrian’s painting, “Broadway Boogie Woogie.” The dramatic rhythm of dancers rehearsing within the building, an amplification of the city’s own jazzy rhythms, becomes underscored at night when the building’s façade displays various patterns of glowing colors highlighting the rhythms implicit in the architectural design. A delightfully offbeat play of color, light, and sound is “Chant de Bambous,” a temporary installation designed by R&B Architectes. Created for the annual International Garden Festival outside of Paris, this installation consists of a maze of long dangling bamboo poles inviting visitors to the site to make their own music as well as change the image of the site as they thread their way through the structure, interacting with green/tan bamboo poles as free-floating architectural elements intended for serious multisensory play. Several dozen international projects certain to stir the coloristic thinking of architects are included in this inspiring visual sourcebook. Speaking of coloristic play, no architect should miss the show “Color Moves: Art & Fashion by Sonia Delaunay,” on view at the Cooper-Hewitt, National Design Museum until June 19th. Delaunay (1885-1979), better known as an abstract painter than in her protean other guises, was a major textile and fashion designer. Her relevance to architects, even to those fundamentally uninterested in fabric architecture, comes from her uncanny genius in perceiving how simultaneous contrasts of certain colors create electrifying movement and rhythm. Her breakthrough regarding color as energy in rhythmic motion akin to modern dance takes on added relevancy today. While software can offer designers up to 30 million colors, these colors are the consequence of a stable algorhythmic formula translated into monitor-framed pixel patterns. Delaunay’s carnivalesque swirls of contrasting colors on fabrics sewn into spectacular dresses and swimsuits conjure fantasies of how their colors played on women in motion. Today’s design software is too rigidly constructed, too locked within solely visual perception, to begin to suggest the moving vivacity of these choreographed organic colors. 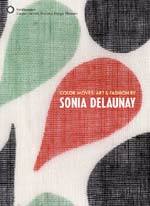 Even if you can’t attend the exhibit, I highly recommend the superb exhibition catalog edited by Matilda McQuaid and Susan Brown, Color Moves: Art & Fashion by Sonia Delaunay (Cooper-Hewitt, $35). Her fabric designs range from outrageous proto-Cubist geometric forms that seem to heedlessly steamroll across garments to delicately conceived flowers in the manner of traditional Russian folk art. And that is yet another key to architects shedding their myopic colorblindness. Vernacular architecture has been coloristically daring throughout the ages. But since courses on vernacular architecture are about as plentiful in architecture schools as those on imaginative color as intrinsic to design thinking, the kinetic chromatic charge of Delaunay’s fabric designs, reconfiguring folk vision inspire where inspiration is needed. In contrast to a handful of books making far-fetched analogies between fashion design and architecture, this catalogue offers hundreds of images that could inspire boldly novel architectural forms. And note her prescience in integrating words – entire poems no less – with contrasting color patterns rhythmically pulsing. What she might have done with a computer loaded with 30 million colors is hard to say. It’s easy to say that with all our design software, we haven’t caught up to her sense of color as dynamic form making urban life festively on the go at high velocity. Norman Weinstein writes about architecture and design for Architectural Record, and is the author of “Words That Build” – an exclusive 21-part series published by ArchNewsNow.com – that focuses on the overlooked foundations of architecture: oral and written communication. He consults with architects and engineers interested in communicating more profitably; his webinars are available from ExecSense. He can be reached at nweinstein@q.com. Hadid's design issues a challenge: define beauty by lyrically playing with illusion. Transferring the musical or cinematic "greatest hits" list mind-set to architecture is deleterious, and here's why. Book Review: "Immaterial World: Transparency in Architecture": Marc Kristal crystallizes increasingly complex notions of transparency with a light touch. Although most of the 25 projects discussed are well-known, they take on additional meaning in this sensitively curated selection. A rediscovered manuscript unveils a portrait of the famed architectural historian as neglected urban designer. His commitment to the picturesque aesthetic for buildings and towns is as urgently needed as ever. Thadani's oversized reference charms, infuriates, and enlightens. Any of you architects seen Mr. Keats Lately? Photographic presentation of a poet of light and concrete triumphs over lackluster commentary.